The Naked and Famous at Harlows Tonight! In the mood for some super happy and energetic electro dance music? 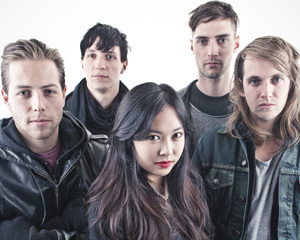 The Naked and Famous are playing at Harlow’s tonight! The Naked and Famous have only been around for a year or so, but they’ve become hugely popular in their native New Zealand and are gaining followers in the United States and all over the world. You’ve probably heard their irresistibly catchy song “Young Blood”—it’s guaranteed to get you in a good mood. A comment on the YouTube video for the song sums it up well : “MGMT and Passion Pit just had a BABEHH”. Tickets are only $15 and the show starts at 8. No word yet on whether the band will be clothed.